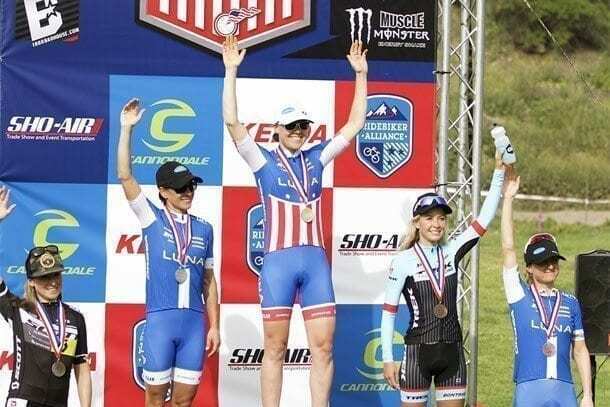 Georgia Gould (Luna Pro Team) and Sergio Mantecon (Trek Factory Racing) won the short track cross country races at the USA Cycling’s US Cup Pro Series presented by Cannondale at Frank G. Bonelli Park in San Dimas, California, on Sunday afternoon. Sunday’s temps were slightly more comfortable than Saturday’s sweltering heat of the cross country race. Georgia Gould raced to victory in the elite women’s short track two seconds ahead of teammate Katerina Nash. The Bonelli short track course was raced for fifteen minutes plus one additional lap. Norco’s Haley Smith got off to a fast start and broke away early on the first lap only to be reeled in prior to the prime on lap three, which was won by Erin Huck (Scott 3 Rox). On the fifth lap, a lead group had formed which would dictate the remainder of the race. 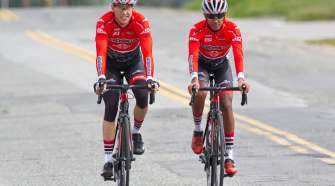 It consisted of: Huck, Ally Stacher, Emily Batty (Trek Factory Racing), Nash, Gould, Andrea Waldis, Catherine Pendrel and Maghalie Rochette (all Luna Pro Team), Smith, Lea Davison (Specialized Racing), Larissa Connors (Ridebiker Alliance) and Sandra Walter (Liv Cycling Canada). The Luna Pro Team took command of the late laps, paving the way for Gould’s fierce attack, which gave her a two-second win ahead of teammate Nash. The men’s race was twenty minutes plus one lap and saw a number of riders lining up hoping that the previous day’s efforts wouldn’t slow them down on this fast and dusty course. A number of early moves were countered until lap seven when the main split had been established. 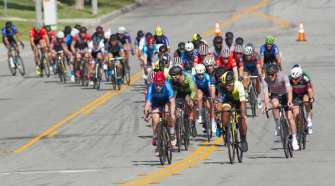 Trek’s Mantecon put in a blistering effort that saw first Todd Wells (Specialized Racing) and then Saturday’s winner Raphael Gagne (Rocky Mountain Bicycles) give chase. Rare Disease Cycling’s Cole Oberman would be the only racer to jump the gap to Mantecon. The two had a nice lead that closed quickly going into the last lap but Mantecon’s surge after the start/finish line on the bell lap left the surprising Oberman in his wake. 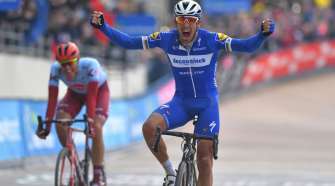 The Spaniard flew around the last lap to take a commanding four-second win after a brilliant race. Oberman crossed second just ahead of Wells while Kohei Yamamoto (Trek Factory Racing) took fourth ahead of Kerry Werner (Raleigh Clement Cycling Team).